This machine could have manufactured parts for the space shuttle. Admittedly, they would have been for the all-wood space shuttle, rather than the more traditional titanium and aluminum space shuttles that got most of the media attention. None the less, the Rikon 70-100 mini lathe is just that cool. A full-size lathe is a useful and engaging shop tool, as long as you have a full-size shop and a full-size credit limit that you don’t mind maxing out. Big lathes can get well into four figures for a respectable one. Upon consideration, you might decide that the most notable applications of a full-size lathe – that would be making really big fruit bowls and baseball bats – don’t turn up in your woodworking efforts all that often. For many users of spinning wood technologies, a full-size lathe is overkill… and overspending. The Rikon 70-100 mini lathe is, to begin with, a bit generous as small lathes go. It can turn anything up to about twelve inches in diameter, and about sixteen inches long. You can buy an optional bed extender to add two more feet to its bed length… which probably qualifies it to address the aforementioned baseball bats. I didn’t buy a bed extender for mine, as I’m not really into baseball. Beyond its more-than-adequate dimensions, the Rikon 70-100 is superbly engineered and built like something only the government could afford. Its design bespeaks a lot of machine-crafting expertise. Well made tools are a pleasure to use, and this one’s practically ecstatic. The Rikon 70-100 is driven by a beast of a half-horsepower motor that feels capable of rotating the Earth. It has a six-position belt-drive pulley system, and a clever motor clamp to make changing gears quick and effortless. Unlike a number of funky low-end lathes, it doesn’t use a lamp dimmer as a speed control, which allows it to deliver its maximum power at whichever of its speeds you dial in. The minute inconvenience of having to stop the machine to change speeds is more than made up for by its serious grunt at all of them. While lathes don’t have a lot of moving parts as a rule, all the ones that turn up on the Rikon 70-100 are beautifully machined, and perhaps not surprisingly, they work flawlessly. The tool rest clamp stays exactly where it’s clamped, the tail stock wouldn’t budge even if it were impacted by an enraged rhinoceros and the head stock spins as if friction were something that only happens in other time zones. Our Rikon 70-100 mini lathe arrived in a really impressive box that was way too heavy for one person to lift. As with most shop tools, it entailed some modest degree of assembly – you’ll need to install its tool rest, bolt its tool holder in place and plug it in. It came with lucid, illustrated instructions to assist in getting it on line. Once it’s ready to rock, the Rikon 70-100 is a peach to play with. Its impressive power renders it virtually impossible to stall, while its absolute lack of funkiness makes creating even tricky round stuff a delight. There isn’t a single aspect of its design that one could wish for improvement upon. 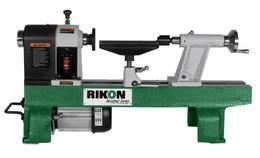 As mini lathes go, the Rikon 70-100 is pretty much at the apogee of its retail bracket. It has a street price of four hundred dollars as I write this, and there are small lathes available for way less. Some of its more affordable competitors are kind of workable, too – if you know a lot about lathes, have several days to kill trying out putative contenders and you’re just naturally lucky, you might hit upon one of them. This said, a few of the low-end small lathes available at the moment are egregious turkeys. Woodworking is no fun at all when there are metal parts flying around the room. By comparison, the Rikon 70-100 is superb, and it’s likely to stay that way until long after your descendants have handed it down to their descendants. While this machine would no doubt impress woodworking professionals who have both ears permanently blocked with packed sawdust, it seems to me to be the perfect lathe for weekend warriors and occasional craftsmen as well. Should you enjoy turning pieces of wood into chips more than you like trying to tweak funky low-end machinery into behaving itself, this is the only small lathe worth considering. Our Rikon 70-100 arrived from Canadian Woodworker Limited, all the way out in Winnipeg, Manitoba. They matched its American retail price, and they shipped it for way less than we’d imagined anything this heavy could be sent half way across the country. The Purolator driver who extracted it from his truck is probably still screaming as you read this. In answer to the obvious question – bet you were wondering about this as well – the manufacturer of this lathe doesn’t appear to be named after the 1952 black-and-white Japanese art film Rikon, directed by Masahiro Makino, which depicts no motorized woodworking machinery. Rikon Tools hails from Billerica, Massachusetts.